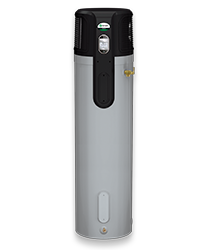 Water Connection Size: 3/4" 3/4"
We've recently added extra insulation to many of our water heaters to meet the new federal efficiency regulations. We have only added an inch or two to most models, but the new larger size may pose a problem when choosing a replacement if your water heater is installed in a tight space. In the new model just won't fit into your available space, your best option may be to install a smaller capacity model. Depending on how much hot water you actually use, you might not even notice the loss in capacity. If you do notice, or if you don't want to take the risk, we recommend installing a thermostatic mixing valve. That will enable you to safely increase the temperature of your water heater and maximize the hot water output. In most homes, you can offset the impact of a step down in capacity by increasing the tank temperature to the maximum setting. This increases your risk of accidental scalding, so we recommend installing a thermostatic mixing valve any time you set your thermostat over 135 F.